Home > US Sports > NFL > Who are the top five MVP candidates so far this season? Halfway through the NFL season, the league is wide open. Records are being broken. Surprise teams are breaking through. Former playoff teams are failing. It has been quite a year so far. It’s only fitting that in an NFL season that has been so crazy and unpredictable, multiple players are making their cases for the coveted Most Valuable Player award. Rivers has put the Chargers on his back this season. Thanks to his incredible resurgence, San Diego is sitting at 5-3 and is in second in the AFC West to the Denver Broncos. 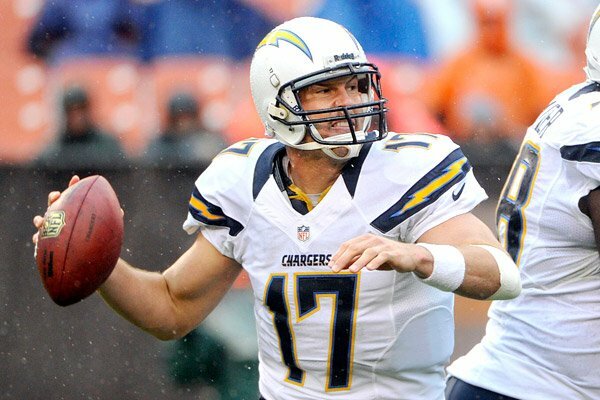 Rivers has thrown for 2,213 yards and 20 touchdowns. He’s also completing 68.3% of his passes, which has helped him reach a quarterback rating of 109.9. Despite injuries to both of their starting running backs, the Chargers are in position to reach the playoffs, and that is thanks to Rivers. He demands nothing but the best out of everyone on this team, and that is why the Chargers will reach the playoffs once again this season. There has not been a player more fun to watch this season than Murray. The Dallas Cowboys are one of the toughest teams this year, and that is thanks to Murray’s incredible running. Without a doubt, he’s the best running back in the league. So far this season, he’s already run for 1,054 yards and seven touchdowns. He’s on pace to break Eric Dickerson’s record for most rushing yards in one season (2,105). As long as he can stay healthy, he can do it. With Tony Romo potentially being injured, we may see even more of Murray in the next half of this season. It should be no surprise that Rodgers finds himself on this list. Despite a slow 1-2 start, Rodgers wasn’t worried. He told Green Bay fans to “R-E-L-A-X.” Packers fans are probably so relaxed watching their team dominate that they feel as though they’re sitting in a massage chair. Rodgers has thrown for 2,092 yards and 19 touchdowns with only three interceptions. The Packers are right behind the Detroit Lions in the NFC North, and if Aaron Rodgers can keep up his stellar play, the Packers can and will win that division. Anytime you mention “MVP,” Manning’s name has to come up. Without a doubt, he deserves to be on this list. At 38 years old, he’s still lighting it up. He broke Brett Favre’s all-time NFL record for most passing touchdowns in a career (508), so everytime he throws a touchdown pass now, he sets a new record. That’s pretty darn cool. He’s thrown for 2,134 yards and 22 touchdowns and also has only three interceptions. The Broncos are the favorites to win the Super Bowl this season, and Manning can lead them there. He certainly deserves a second ring before he retires. Maybe he can get it this year. It’s not too often you see a defensive player in the running for MVP. In fact, the last time a defensive player won MVP was 1986, when linebacker Lawrence Taylor of the New York Giants won the award. Since then, the award has gone to only quarterbacks and running backs. Watt could certainly change that with his dominating performance so far this season. He is without a doubt the best defensive player in the league. He’s a threat to cause chaos on every play. He has 32 tackles, seven sacks, a forced fumble, three fumble recoveries, an interception, a blocked kick, and three touchdowns. Those touchdowns have come from an interception return, a fumble return, and one incredible receiving touchdown. While the numbers may not be the most impressive, his presence alone makes the Texans defense one of the best in the league. What’s The Mata With Everyone?